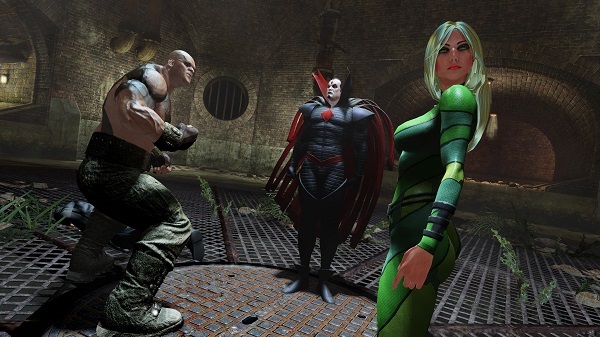 Superhero games come and go and only occasionally does one come along that is not only memorable, but worthy of multiple sequels. In an age where multiple superheroes are appearing in video games, it was only a matter of time before the Merc with a Mouth was given his own video game, or as the game would like us to think, before he demanded a game was made of him. As such, High Moon Studios has brought Deadpool to the public but does the title have more than just the titular anti-hero himself? The storyline of Deadpool is one that transcends the ages by seeing the anti-hero lose a loved one and seek vengeance against those who took them from him. Just kidding, that would require a script of some kind and Deadpool doesn’t do scripts. In fact the only reason that Deadpool had his game made by High Moon Studios in the first place is with some extreme negotiating involving explosives. Anyways, Deadpool is a game that very much knows that it is a game and Deadpool talks on the phone with the developers of the game a few times throughout the title, especially whenever they have something to complain about or the visual quality or style of the gameplay suddenly shifts drastically on purpose. Deadpool eventually does find some focus when he goes after Mister Sinister and teams up with members of the X-Men and a familiar face, Cable. Despite having a rather paper-thin story that has a number of interesting moments, especially related to Death as she appears in the game. Most of these interesting moments have to do with just how outlandish Deadpool is as a character. To list off everything this schizophrenic anti-hero does would take pages as throughout the game he commonly has discussions with the voices in his head, one which is a bit more reasonable while the other is screwier than Deadpool’s normal self. As one would expect with Deadpool, the character doesn’t even realize that there is a fourth wall of any kind and often converses with the player, such as asking them to please end their pain as Cable goes on an extravagant rant or even hopping along speech bubbles at times. Deadpool is what makes Deadpool the game Deadpool fans have been waiting for, and just for one more Deadpool in a sentence… Deadpool. As such, most of the game’s entertainment value relies upon the character himself and the amount of comedy that they can throw at the player. Deadpool takes the shotgun approach to humor by throwing practically everything they can at the player and hoping that they will be struck with laughter more often than not. A lot of the jokes are low-brow or perverse but that isn’t an issue as that is fitting with Deadpool’s character and it is played in a manner befitting the situation and is more often than not, genuinely hilarious. Character models in Deadpool are decent looking on consoles and anyone familiar with the comics will instantly be able to recognize most of the unfamiliar heroes and villains that they come across as they each feature a signature look. Deadpool’s clothing can be ripped after taking lots of damage and he even shows actual wounds on his body, though these are rather poorly handled and usually are only noticeable if you’ve been killed and see it on the restart menu. Outside of the named characters, the game takes a significant hit in the graphics department as players will be fighting the same looking enemies time and time again, and while it is explained that they are “clones” it is still weak. 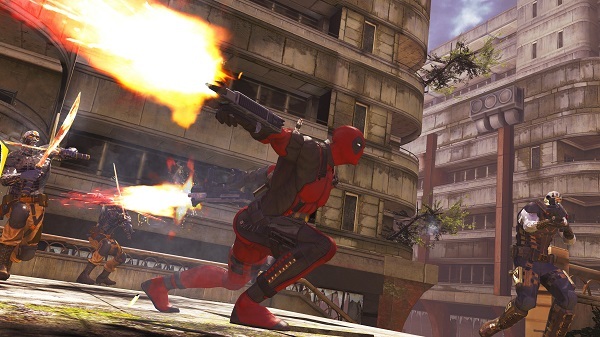 It also doesn’t help that despite Deadpool’s colorful nature, almost every environment you go through is a variation of brown and grey with only the temporary shifts in perspective providing some sort of relief from the monotony of basic level design. The only way that a lot of the humor that works in Deadpool works so well is thanks to the man voicing the character, Nolan North. Nolan made the character his own with his voicing of the character by delivering every line of dialogue exactly as one would expect Deadpool himself to do so. Without the Merc with a Mouth being voiced by Nolan, many people would probably have wished his mouth was sewn shut. The rest of the cast is suitably voiced but Nolan easily steals the show considering the fact that the background music used throughout the game is basic even at the best of times, leaving pretty much nothing memorable as far as a soundtrack goes. A great story or great characters can help make a game great, but at the heart of it, gameplay is what gamers are looking for in a game and what they’ll find in Deadpool is about as standard as it gets. 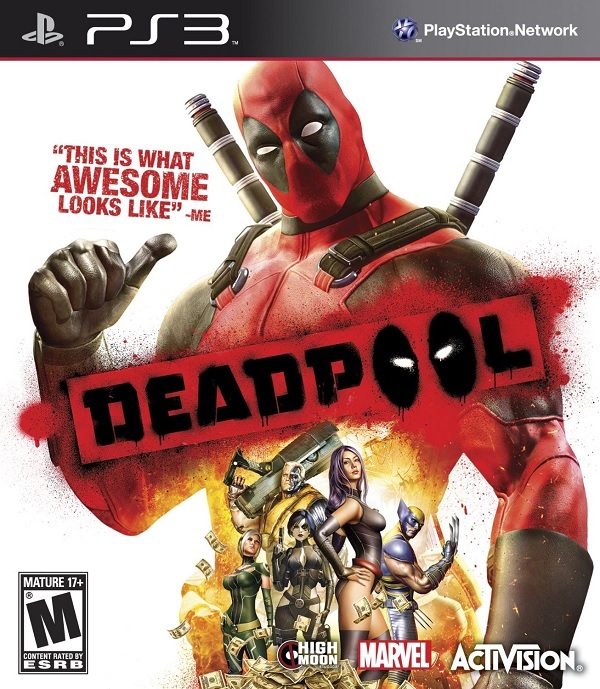 Deadpool features basic action game elements with button mash combination attacks, some gunplay and various upgrades to help show some sign of progression. 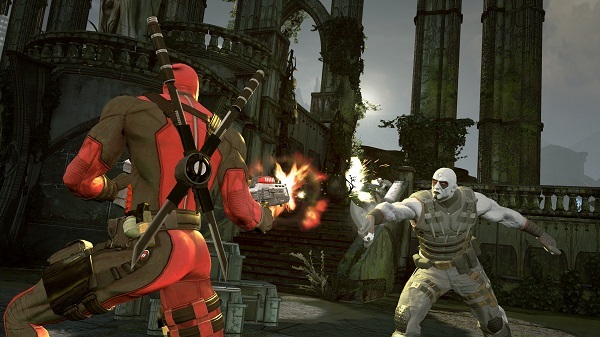 Combat in Deadpool features the titular character taking on numerous enemies in different rooms with two swords and his handguns, though these can be swapped out for two sai or two sledgehammers and other firearms through upgrading. Enemies are dispatched through simple button combos that always display the exact same attack animations, countering enemies when they show prompts above their head and you can even work shooting into combos as well through something the game calls “Gunkata” attacks. However the formulaic approach to combat grows old very quickly even when the enemies you fight are numerous, as they are squishy and easily dispatched on harder difficulties with only minor mini-boss fights worth much of a challenge and boss battles that simply drag on. It also helps that Deadpool’s regenerative abilities allow him to fully heal all damage he has received after not taking damage for a set period of time, or with upgrades, after dealing enough damage in a combo attack. 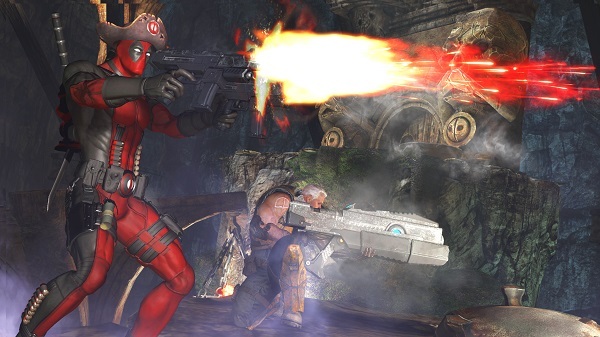 The aforementioned upgrades can be bought with Deadpool points that are received by killing enemies and are multiplied by the amount of combo attacks you managed to string together, with the total only being added to the Deadpool points pool after you don’t get hit or deal damage for a few seconds. Upgrades range from more of the earlier mentioned weapons, various abilities added to previously unlocked weapons or upgrades to Deadpool himself, but the customization is surface level at best, making the game’s replay value zilch, since most of the jokes are only funny the first time, and challenge maps that offer absolutely nothing that the game hasn’t already had the player do a hundred times already. 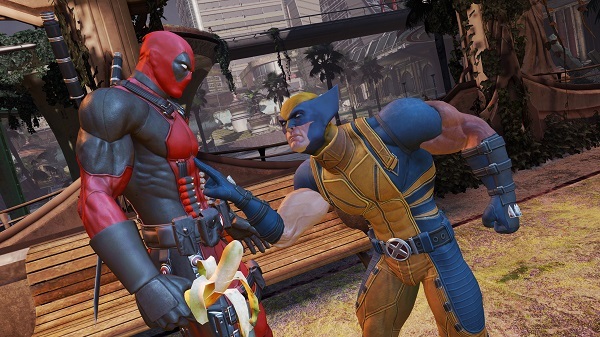 Deadpool plays it safe as far as gameplay is concerned by doing little than offering standard action gameplay that grows tiresome as players make their way through the seven hours that Deadpool has to offer. 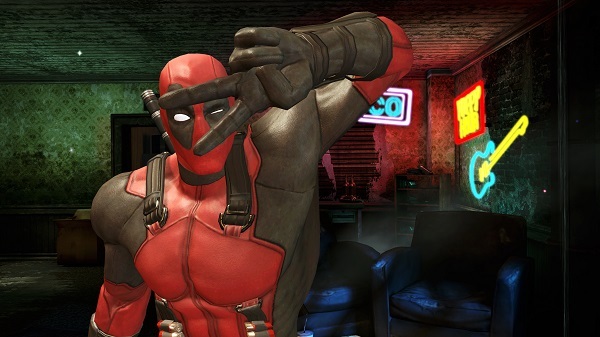 Where Deadpool succeeds is with its numerous jokes delivered by Deadpool who is excellently voiced by the Nolan North. As such, Deadpool fans probably couldn’t have asked for anything more than this game has to offer since it keeps the character alive and true to his nature, but does little beyond that to be anything more than average.